Crowd-funding website Kickstarter is being sued for its promotion of a new 3D printer. 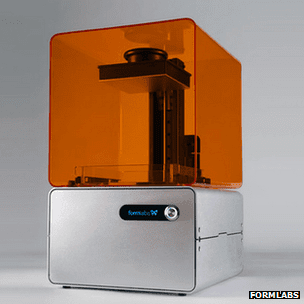 More than 2,000 users contributed over $2.9m (£1.8m) to help Massachusetts-based Formlabs build the device. However, 3D Systems – a leading maker of printers that turn computer design files into real-world objects – has alleged one of its patents was being infringed by the machine. It has also filed a lawsuit against Formlabs itself. The two defendants have yet to respond to the accusations. At the heart of the allegations is a printing technique called stereolithography. It involves directing an ultraviolet laser across a liquid synthetic substance to cause a thin layer to solidify. This is then repeated layer-by-layer, with the shape of the resulting object determined by the pattern drawn by the laser beam. The technique has been about since the 1980s. However, California-headquartered 3D Systems identified a problem with the process – if a feature was too thin at one point and unsupported, it might not solidify properly or result in the object losing its shape. The firm came up with a solution that involved adapting the procedure so that each layer did not need to be completed before moving onto the next one. By staggering the point at which each part of a cross-section is solidified, there is greater opportunity to provide structural support for each feature. 3D Systems said this resulted in the opportunity to make more accurate, higher-resolution objects. It was awarded a patent for the method in 1997. When the MIT (Massachusetts Institute of Technology) Media Lab researchers behind Formlabs submitted their fundraising campaign to Kickstarter, they made a virtue of the quality of the print-outs they could offer. They said that by using stereolithography, their printer could offer “layer thicknesses and feature sizes that are worlds ahead of what is possible with” the existing technique used by budget printers, which melt plastic and squeeze it through a nozzle to build up each layer of an object. They noted other high-definition 3D printers typically costed tens of thousands of dollars, but said they would provide their Form 1 printer to anyone who pledged $2,299 or more. However, 3D Systems said it was “well known” in the industry that it had a significant portfolio of stereolithography-related patents and had already been involved in other lawsuits to defend the intellectual property. As a result, it said, Formlabs must have known, or chosen not to find out, whether there might be a risk of patent infringement. I’ve noticed that you’ve written about Kickstarter campaigns and just thought that you might be interested in ours. We are launching our very own crowdfunding campaign for our company, Protos Eyewear, to crowdfund custom fit eyewear made via 3D printing. Unfortunately, Kickstarter no longer allows eyewear, so we have to work extra hard to get the word out. We would be forever grateful if you can share our project with your readers, friends, or whoever you think would be interested, as we prepare for our launch!